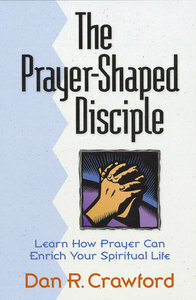 - Discover basic guidelines on how to pray, including the ACTS model and the Lord's Prayer, plus tips for teaching children how to pray.^- Learn how to pray more effectively in various situations, such as with prayer partners, family members, and small groups, alone in solitude, or in a public forum.^- Recognize the role of prayer in evangelism and world missions, as well as the reality of spiritual warfare.^- Sidebar areas within chapters contain key scripture texts for easy topical study and future reference. - Publisher Discover how prayer can mold your spiritual life with Professor Dan Crawford's The Prayer-Shaped Disciple! You'll learn how to commune with Christ using Crawford's insights as a prayer warrior as well as poignant illustrations from the Bible, church history, and literature. This guidebook also answers often-asked questions about prayer and explains how it can be used for world evangelism and spiritual warfare. Discover how prayer can mold your spiritual life with Professor Dan Crawford's The Prayer-Shaped Disciple! You'll learn how to commune with Christ using Crawford's insights as a prayer warrior as well as poignant illustrations from the Bible, church history, and literature. This guidebook also answers often-asked questions about prayer and explains how it can be used for world evangelism and spiritual warfare.